Who says you can't run away from your problems? You are a failed novelist about to turn fifty. A wedding invitation arrives in the mail: your boyfriend of the past nine years is engaged to someone else. You can't say yes--it would be too awkward--and you can't say no--it would look like defeat. On your desk are a series of invitations to half-baked literary events around the world. What would possibly go wrong? Arthur Less will almost fall in love in Paris, almost fall to his death in Berlin, barely escape to a Moroccan ski chalet from a Saharan sandstorm, accidentally book himself as the (only) writer-in-residence at a Christian Retreat Center in Southern India, and encounter, on a desert island in the Arabian Sea, the last person on Earth he wants to face. Somewhere in there: he will turn fifty. Through it all, there is his first love. And there is his last. Because, despite all these mishaps, missteps, misunderstandings and mistakes, Less is, above all, a love story. A scintillating satire of the American abroad, a rumination on time and the human heart, a bittersweet romance of chances lost, by an author The New York Times has hailed as "inspired, lyrical," "elegiac," "ingenious," as well as "too sappy by half," Less shows a writer at the peak of his talents raising the curtain on our shared human comedy. 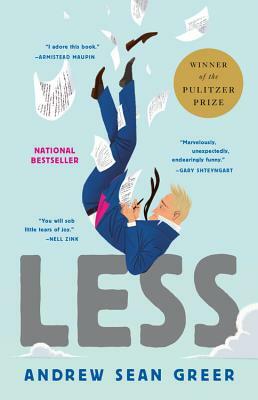 Andrew Sean Greer is the bestselling author of five works of fiction, including The Confessions of Max Tivoli, which was named a best book of 2004 by the San Francisco Chronicle and the Chicago Tribune. He is the recipient of the Northern California Book Award, the California Book Award, the New York Public Library Young Lions Award, the O Henry award for short fiction and fellowships from the National Endowment for the Arts and the New York Public Library. Greer lives in San Francisco. He has traveled to all of the locations in this novel, but he is only big in Italy. "I adore this book. It's funny, piquant, bittersweet and so achingly observant about the vanity of writers that it made me squirm in recognition. I'll probably read it again very soon." "A fast and rocketing read with everything I want from a story--moments of high humor, moments of genuine wisdom, sharp insights and gorgeous images. A wonderful, wonderful book!"